1. What's the most embarrassing motorcycle you lusted after in your youth? 2. What's the worst motorcycle you ever owned? Probably a 1959 Norton 350, but it had its moments. 3. What motorcycle would you ride if money (or job!) were no object? A brand new Yamaha 350 LC put together by Harald Bartol. Completely daft. 4. What's your favourite stretch of asphalt? The IOM TT circuit, although I haven't been there for years and am a MotoGP person. The old mainland A road network used to be brilliant when there was less traffic and not too many speed limits. 5. What is the best thing you ever did on a motorcycle? It's always great when you overtake a huge traffic build-up and pop out the front with a clear road ahead. 6. What is the maddest thing you ever did on a motorcycle? Deciding to go to Istanbul on a 1956 Lambretta. 7. What is the worst thing that has ever happened to you on a motorcycle? Seizing Jim Redman's works 350 Honda four when I was warming it up. 13,000rpm to zero in half a second, and a dreadful silence. It wasn't my fault, honest. 8. What is the most miserable time you've had riding a bike? One of those winter nights when the bike started to misfire or lose a cylinder and, when you stop to poke about, there's a layer of ice on your jacket and your hands are so cold you can't grip the plug spanner, it's snowing and you've still got 40 miles to go. 9. Who's your all-time motorcycling hero, and why? In the Industry, John Bloor for what he's done at Triumph. In GPs, well, nearly everybody, though since he won't be reading this, I can admit to Kenny Roberts being a bit of a star. 11. What motorcycle did you first do 100mph on? My Norton Vincent a long, long time ago. 12. What's the fastest you've ever ridden? You can go awfully fast at Bruntingthorpe without knowing it. 150-plus there isn't as fast as 65mph up the Charing Cross Road. 13. What's your pet hate in motorcycling? Hopeless nostalgia freaks and humourless macho attitudes. 14. What's the most you'd spend privately on a bike? I try not to. But I'd make a sensible offer on a Moto Rumi. 15. What's the one piece of essential equipment you need on your bike? Handlebars. Maybe a large tank, I hate filling stations. 16. 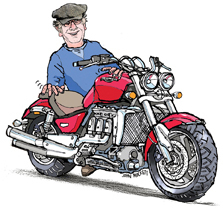 Two-stroke or four-stroke, and why? I like two strokes, easy to work on, light and funnier than diesels. 17. What achievement by a rival are you most envious of? Soichiro Honda would be a good place to start on a list, but then, I'm still alive. 18. What are the trends in your field that are just below the horizon right now? Honesty in design, not marketing. We should make bikes that people enjoy. There's no point in doing 170mph or riding a truck. 19. If you could switch careers, what would you like to do? I could be an illustrator, a job takes a day, not three or four years. 20. How much are you paid, and are you worth it? Too much, and obviously not.